Many people suffer from joint pain, and indeed painful joints may occur for several reasons. Long periods of sitting or inactivity may cause pain. Chronic inflammatory conditions such as rheumatoid arthritis, osteoarthritis, gout, bursitis, as well as other injuries such as sprains and strains. Regardless of the source, painful joints can turn every day into a burden. 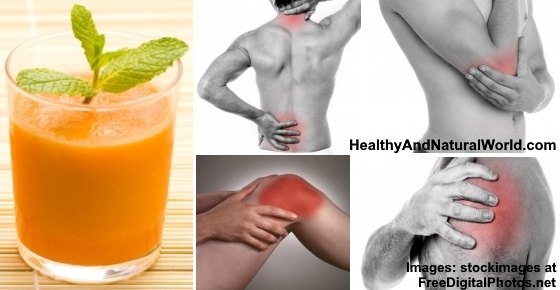 Luckily, much of this pain can greatly be reduced by this delicious smoothie which has proven anti-inflammatory properties. The following ingredients are scientifically proven to help reduce pain associated with chronic inflammation in your joints. You can find the recipe at the end of the article. Pineapple is one of my favorite fruits. It’s not only juicy and delicious, but has many healing properties that I’ve mentioned in my article about how to use pineapple as a medicine. Pineapple contains an enzyme known as bromelain, which is a proven anti-inflammatory agent. A 2002 study published by the International Journal of Phytotherapy and Phytopharmacology found that bromelain was effective in treating physical symptoms of mild knee pain1. The study also indicated that bromelain was able to improve the general well-being of knee-pain sufferers, as well as mentioning that it helps to reduce symptoms of osteoarthritis and rheumatoid arthritis. Furthermore, bromelain may be a safe and effective alternative to over-the-counter nonsteroidal anti-inflammatory drugs (NSAID) pain relievers, which have been associated with gastrointestinal pain and disorders. A 2012 study published by the Biotechnology Research International Journal credited bromelain as an alternative to NSAIDs2. The study stated that bromelain had strong analgesic properties that were determined to be effective against pain mediators in the treatment of patients with rheumatoid arthritis. You can find other natural alternatives to NSAID drugs in my article about 15 natural and effective alternatives to Ibuprofen (Advil). Turmeric can be found in many Indian dishes and has been around for centuries in Ayurvedic and Chinese medicine to treat a wide variety of health problems. This herb provides natural anti-inflammatory and pain relieving properties with its key ingredient called curcumin. Studies have shown that turmeric is effective at easing pain and that it is a great help in relieving chronic arthritis and joint pain8,9. This is why it’s one of the ingredients in this anti inflammatory and pain reducing tea. Although black pepper is not normally added to smoothies, it serves a distinct purpose. A 2015 study published in the International Journal of Food Science and Nutrition concluded that black pepper was responsible for increasing the antioxidant level of turmeric when taken together5. In addition to enhancing the absorption of turmeric, black pepper is also an anti-inflammatory agent. According to a 2013 study from the team at Critical Reviews of Food Science and Nutrition, the active ingredient in black pepper is piperine, which is composed of volatile oils, oleoresins, and alkaloids that are responsible for its anti-inflammatory benefits7. Like turmeric, ginger is a commonly used spice and is a favorite by many people. As a powerful anti-inflammatory agent, ginger has long been used for its healing powers (read more about it in my article on how to use ginger as a medicine). A 2001 study published by the Arthritis and Rheumatism Journal indicated that a highly purified and standardized form of ginger extract was beneficial for reducing the symptoms of osteoarthritis in the knee3. Furthermore, the study also stated that ginger had a very good safety profile with little side effects (but there are certain types of people who should avoid ginger). A 2005 study published in the Journal of Food Medicine indicated that ginger has strong anti-inflammatory properties and it can be beneficial in fighting chronic inflammation6, which is often responsible for causing pain in joints. Tart cherries are a well known natural reliever of inflammation-induced pain backed by research (and you can read more about them in my article on how to fight joint pain and inflammation with tart cherries). Of all the cherries, tart cherries also contain the highest level of anthocyanins which have powerful antioxidant and anti-inflammatory properties. They are indeed a super food, and can be consumed in many different forms: fresh, dried, frozen, as a juice or in an extract form. If you cannot get tart cherries, you can use other types of berries that also contain high amount of anthocyanins and vitamin C, such as blackberries, cranberries, raspberries and blueberries. To learn more about the amazing healing properties of berries, have a look at my e-book The Healing Berry Guide. Coconut oil is such a versatile ingredient which is used for so many things (read about them in my article about 60 uses for coconut oil). Coconut oil helps relieve joint pain in two ways. First, coconut oil helps with turmeric absorption and I’ve mentioned it in my post on how to optimize turmeric absorption and bio-availability. Coconut oil is also full of anti-inflammatory properties by itself, which may help reduce the pain associated with joints. A 2014 study published in the International Immunopharmacology Journal showed that coconut oil contains anti-inflammatory and antioxidant properties that may be able to ward off arthritis4. Place all the ingredients in a blender and blend at high speed. You can drink it immediately or make a larger amount and store in a glass jar in the refrigerator. very good information.Can Diabetic patients use pineapple? Pineapples have high sugar content and glycemic index so you need to be aware of it if you are diabetic or pre-diabetic and limit your pineapple consumption. According to Livestrong website, a serving of slightly under 3/4 cup of fresh pineapple makes it unlikely to cause blood sugar spikes. They recommend to eat pineapple with foods low in carbohydrates or low on the glycemic index to decrease your meal’s overall glycemic load and limit blood sugar increases and to watch your total carbohydrate intake at the meal. There is a natural enzyme product called Wobenzym PS that has the proteolytic enzyme (bromelain) of pineapple.It comes in tablet form and you take them before your meals. This product is extraordinary for joint pain and won’t raise a person’s sugar level. The only caution to it, is you shouldn’t take it if you are on any blood thinning medications such as Warfarin or Plavix. Would like to know, To be more effective. for how many days this treatment should be applied. Thanks. I’m not sure as every person is different and I don’t think there is a set amount of time that fits all. Thanks very much i learn more about the benefits of ginger,garlic,turmetric,pineapple.i usually use it my food subtances. Hello I am 37, I have a neck, shoulder and uper back pain, feeling cold in a small area of uper back, I don’t know it’s stiffNess or what please suggest me to how to get out of pain. Can you substitute with Black Pepper Essential oil? Piperine is the main active ingredient in black pepper that helps turmeric absorption. From what I saw in this research, black pepper EO contains piperine too, so I assume that adding 1-2 drops of black pepper EO to the mix can aid turmeric absorption.